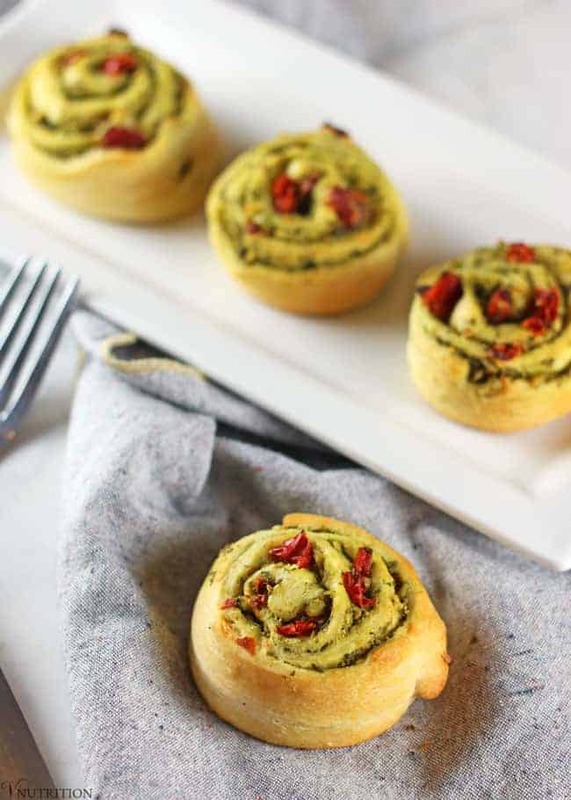 These Christmas Pinwheels are a festive appetizer for any meal or party. 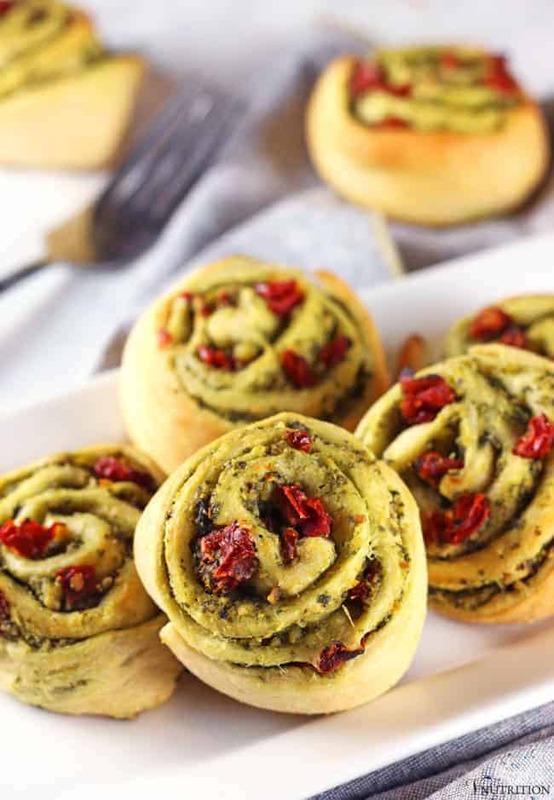 Pesto and sun-dried tomatoes are featured as the red and green ingredients to really bring out holidays! Christmas is my jam. The day after Thanksgiving, Matt and I start our decorating. The whole house gets decked out in green and red. Hopefully, you’re like me and are really into a good holiday-themed snack. 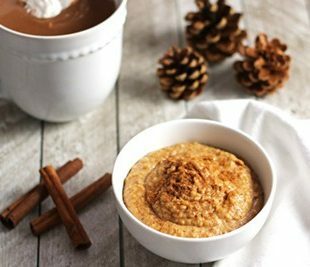 I have shared a few of my Christmas treats before like my Snickerdoodle Cookie Dip and Gingerbread Hot Chocolate but I wanted something people could pick up and savor as they are walking around a party or while tree decorating. I think I have the perfect snack for you enjoy this holiday season – my Christmas Pinwheels. 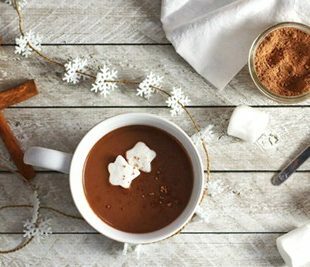 This time of year everyone is looking for festive ways to celebrate the season. Red and green are always a hit so I knew those colors would be entwined in the recipe somehow. 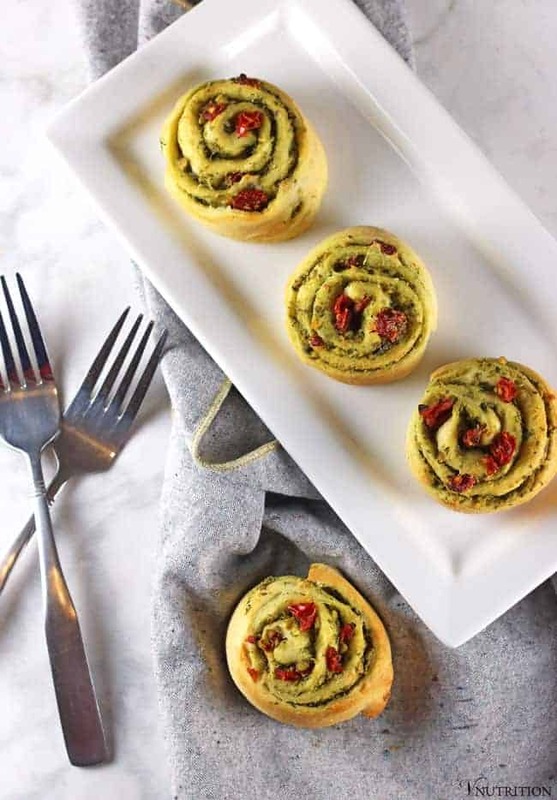 Biscuits make a great appetizer but I wanted something more playful so as a fun twist on biscuits, I decided to make biscuit pinwheels and that’s when the idea of Christmas Pinwheels came to me. While they all sounded good, I ultimately went with what I had in my fridge at the time of recipe testing – leftover pesto and some sun-dried tomatoes. I knew they’d work well together because I make sun-dried tomato pesto often and it is de-licious. Once I had my filling decided on, I went about figuring out how to actually make pinwheels. I used the Pillsbury Crescent Dough Sheet (excited it was actually vegan) and rolled it out being careful to not pull it apart and pinching together any of the perforations to make sure it was one long sheet of dough before really starting on the pinwheels. Pinwheels are fun to make for kids of all ages. I know I had a good time slathering on the pesto, adding the tomatoes and rolling them up. I think this would be a great recipe for the whole family. To make these even more festive, you could stack the baked pinwheels into a Chrismas tree form when serving them. I wanted to do that for these pictures but Matt and I were too busy eating these babies right out of the oven. I realized too late that I wouldn’t have enough to stack them – poor planning on my part but it does say something about how tasty the pinwheels are. 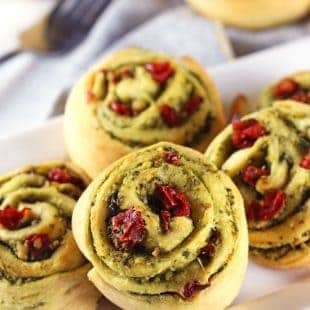 For the Christmas Pinwheels, I use my Pistachio Pesto which I think adds a little more holiday sparkle with the extra green in the pistachios. I also use the fresh sun-dried tomatoes. I noticed cutting up sun-dried tomatoes can be a bit challenging (is it just me?) so as a shortcut, I actually cut them with scissors. I was amazed how well that worked. Another shortcut I used was pre-making the pesto. I made a big batch for recipe testing after my first pinwheel trial with puff pastry did not go as well as I planned. The pesto still tasted just as good in the pinwheels on the following day of testing. 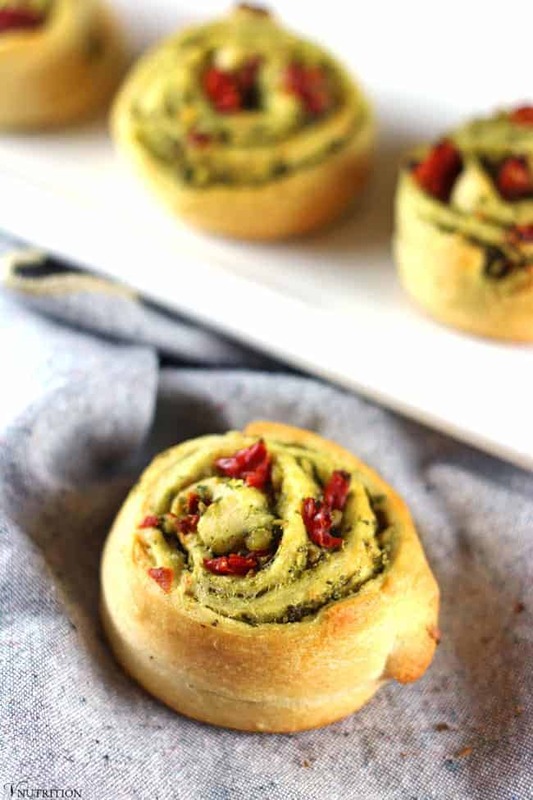 I think the pesto and sun-dried tomato combo really give these pinwheels a kick of flavor. Your guests will be impressed by how fancy they look but you’ll know how easy it was to make. I hope you enjoy my Christmas Pinwheels! Have a wonderful holiday season! Sprinkle some flour on your working surface and roll out the Pillsbury Crescent Dough Sheet, being careful to not pull it apart. Pinch together any of the perforations, making sure it is one continuous sheet of dough. Spread the pesto over the whole sheet and sprinkle sun-dried tomatoes. Take the shorter side and roll up the sheet of dough being sure that the end is pinched together so nothing falls out. Cut off the sad looking ends that might not be exactly perfect, then cut the roll into 8 pieces. Bake at 375 degrees for 12-16 minutes or until the edges get a golden brown. Share your pictures of any of my recipes on Instagram and use #vnutrition or tag @v.nutrition so I won’t miss it! Post your photos on the VNutrition Facebook Page as well! Mary Ellen Valverde MS, CNS, LDN is a licensed nutritionist and Certified Nutrition Specialist helping clients regain their energy, confidence and health through a plant-based diet. She received her master’s degree in nutrition from the University of Bridgeport and completed her nutrition residency at the functional medicine clinic of Dr. Kara Fitzgerald. Thanks Kari! I’ll probably be making them a few times this month too! These look amazing! Love them for a new option for holiday parties. They sound SO good! Thank you so much Karly! It’s my jam too and these look perfect for entertaining, very pretty. Thanks! These are so deliciously adorable, Mary Ellen! These look so good Mary Ellen! And I love how simple they are! 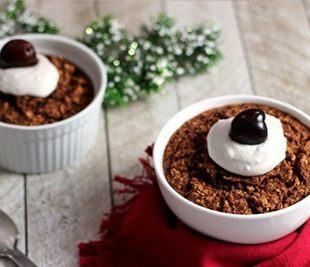 I had no idea Pillsbury made anything vegan- I’ll have to check that out:) Hope you’re enjoying your holidays! Thanks so much Kate! Yeah, I totally hear you. I have been so out of things the last few months! I'm Mary Ellen, a functional nutritionist with a passion for guiding women to feel their best. I want to show you how a plant-based diet can have you looking good, feeling better, and eating well. Mary Ellen/VNutrition and Wellness LLC is a participant in the Amazon Services LLC Associates Program, an affiliate advertising program designed to provide a means for sites to earn advertising fees by advertising and linking to Amazon.com. Unauthorized use and/or duplication of this material without express and written permission from this blog’s author and/or owner is strictly prohibited. Excerpts and links may be used, provided that full and clear credit is given to Mary Ellen/VNutrition and Wellness LLC with appropriate and specific direction to the original content.